After debuting its MacBook Pro refresh back in July, Apple now sells refurbished models of the latter in its online store in Canada for the first time. 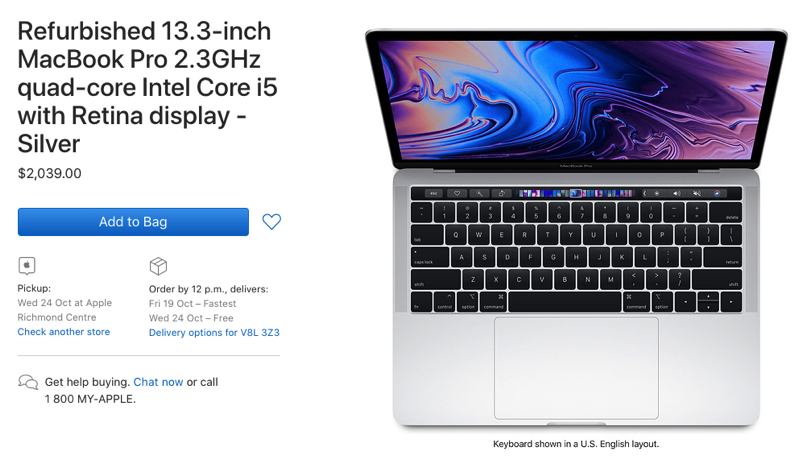 Starting prices, as of writing, being at $2,039 CAD (15% off, savings of $360) for the 13.3-inch MacBook Pro with Touch Bar, with a 2.3GHz quad-core Intel Core i5 CPU, 8GB of RAM and 256GB SSD. Refurbished products from Apple are literally good as new, except for the shiny retail boxes. They come with the company’s one-year warranty and also their 15-day return policy. As of writing, 19 various configurations of the 13.3-inch MacBook Pro are available, with the highest-priced model being the 2.7GHz quad-core model with 16GB of RAM and a 2TB SSD. Stocks are usually limited with these refurbs, so it’s best to act quickly if you’re going to jump on them.